Worried that tuition and room and board will bleed you dry when your kid goes off to college? Pfft. Wait till you get a load of all the expenses you didn't account for! You'll want to sit down for this. You'll want to send your kid off to college well prepared — with things. Things like study and work supplies, dorm room necessities, snack foods, toiletries, a new computer, maybe a new phone. It's amazing how easily items pile up when you're shopping for college. No loving parent can go too long without seeing their kid — especially their freshman year in college. So, you'll need to account for travel costs to get your child back and forth to your home if they attend a school that requires more than a few hours' travel. "Create a travel budget by researching typical costs for airfare, train, or bus, whichever mode of transportation is available to you, and estimate the number of times your child will head home throughout the year," suggests money-saving expert Andrea Woroch. "If they have a car and are driving [a long] distance away from home, propose that they carpool to save on gas and tolls if applicable." They can also use a site like Zimride, which will connect them with other college students looking to share a ride. If your child has a car on campus, you're looking at the cost of a parking pass plus insurance and gas. If they don't have a car, you'll need to consider a new bike and investigate the cost of public transportation passes. These costs can add up, as well. College students don't tend to be holed up in their tiny dorm rooms while not in class. College meal plans are expensive enough by themselves, but don't count on those being your child's only source of food. Many campus dining halls close earlier than you probably think, and late night study sessions require energy. Plan on having to send them some extra dollars for groceries, snacks, and late-night diner runs. I was interested in joining a fraternity when I went to college. It signified the quintessential coming-of-age experience to me, and I liked the idea of having "brothers," as I wasn't close with my own growing up. Nice sentiment, but it got expensive real quick. My dues were about $400 per semester, I wanted to buy new clothes every time we had a formal or theme party, and if something went wrong in the house — like the one time a drunk alumni brother smashed up our soda machine — we had to collectively cover the cost. By the end of four years, I had spent thousands of dollars to be part of this exclusive club — which, in hindsight, was worth every penny considering the memories I made. So, I guess what I'm saying here is … grab your checkbook. If you're the parent of a child whose athletic skills have earned them a college scholarship, congrats; consider yourself lucky. On the other hand, if your child is perfectly average but still wants to play sports or join extracurriculars, you'll need to cough up the cash. "Sometimes participating in extracurricular activities on campus can cost extra money," says Johan Zhang, co-founder of CollegeVine. "Whether it's paying for club dues, schoolwide participation fees, or even apparel, at many colleges there exists a hidden cost to joining and being an active member in extracurricular activities.."
Be sure to consider this and save up in advance. Bringing your kid home is going to cost you, and so is traveling to visit your child. You may also want to attend things like orientation weekend, parents' weekend, and other events hosted by the college. You'll need to factor in transportation, lodging, and food, so budget wisely. Eventually your kid will outgrow the dorm and want to live off-campus. This usually happens around junior year, but sometimes you can hold it off until senior year. With that comes the expense of monthly rent, renter's insurance, furniture, utility bills, and a security deposit that you're never going to see again. Make amends with that right now; it's already spent. Listen, I'm rooting for you to get your kid in and out of college in four years, but, well... the odds aren't in your favor. "At most public universities, over 80 percent of students will take more than four years to graduate due to overcrowded or unavailable classes," say Adrian Ridner, CEO and co-founder of Study.com. 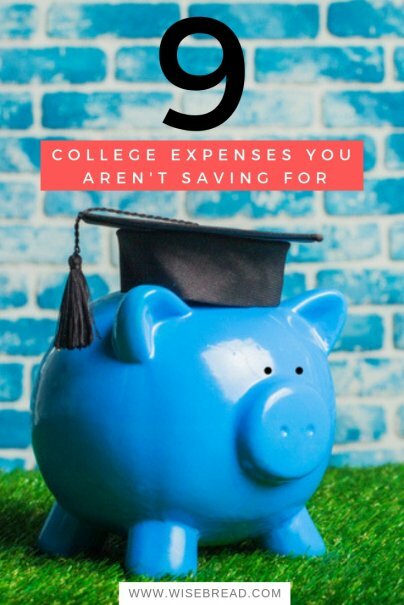 "That means if you are planning on four years of college expenses, you could be under budgeting by 25 percent to 50 percent. Taking low cost college courses online can be a great way to stay on track and graduate on time. Another factor that can extend your child's time in school is lack of college readiness. This may mean completing remedial courses that do not count toward graduation."